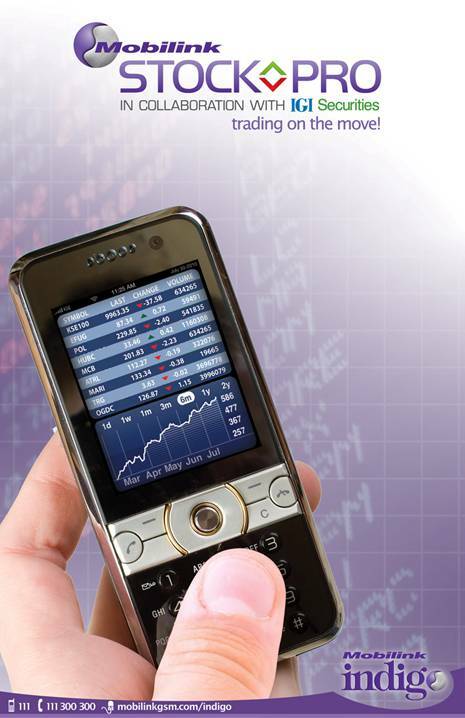 Mobilink offers its customers the opportunity to view and trade live stocks in Karachi Stock Exchange. Mobilink StockPro developed in collaboration with IGI Securities offers its subscribers the ability to view live stock data in Karachi Stock Exchange and if you have a trading account with IGI Securities, it also allows you to trade as well! Now, Mobilink customers can remain connected to Stock Exchange via Blackberry or any other Java enabled mobile device, with the help of Mobilink StockPro. So where ever you are or even while you are on the move, you can view and trade your stocks at ease and convenience with Mobilink StockPro! An option by which users can request any symbol rate and related market information. The quote symbol could be any symbol not part of the subscribed list. Users can add or remove any symbol from the subscription list. While adding a symbol, application will not permit to exceed the subscription limit which is up to 10 scripts at a time. Users can remove any symbol from the subscription list by pressing removing button. Volume Leader Screen: Users can view the top 10 market leaders by volume at any given time. Top Gainers/Losers Screen: Top Gainers Losers Screen displays top 5 gainers and top 5 losers of current market. Help Screen: Help screen includes description of entire Screens in Stock pro application. The customer will send SMS <SUB> to the short code 4442. For trading, customers will be required to first open an account with IGI. For this purpose, a visit to an IGI branch will be mandatory. After 10 days of trial period, customer will receive an SMS from short code 4443 to renew the subscription by replying to that SMS. This subscription will be charged as per charging mentioned below. Subscription is free for first ten (10) days as trial. After the trial period, the subscription will be charged at Rs.20 + Tax per month. Mobilink is at its best to offer new service to its customers. But I request them to kindly upgrade their pathetic network to improve the service quality which was stuck after mid ramazaan till Eid third day!!!!!!!! Its literally on your fingertips! The service looks good and price is reasonable. I will try it out for 10 days and see how it goes.